Cheap Thrills - Boston: WED 12/2: Cupcake, Talks, Music Awards, Bingo! Can you believe it? After dreaming of a free cupcake, I passed through Ball Square without stopping at Lyndell's. I still encourage others to go. "One free cupcake per customer." (Until supplies last, presumably.) There's some info in the post below, but people should enjoy free food when it's offered. Thomas R. Insel, MD: "Autism: What we know? What we need?" If I find autism fascinating, then some of you might be curious enough to consider going to this lecture by Thomas R. Insel, MD (Director of the National Institute of Mental Health) that's described as an "attempt to summarize what we know and what we need to know in 2009." Sometimes I think you can get without RSVP'ing, but I doubt that will be the case tonight. (It's probably full.) Reception to follow. I can't say this will be a great night. Between the award presentations, there should be live performances and "video retrospectives". I couldn't find a list of performers, but it usually consists of nominees (full list). There are the VIP's, and there are general admission tickets; I'd like to think that a few chairs will be available for plebeians who feel like sitting. You have to register with site for the discount tickets (thanks to The Phoenix), because it's actually a donation. Proceeds will benefit Music Drives Us Foundation, which means that Ernie & The Automatics will probably play. Ernie Boch Jr sells a lot of cars and knows how to play guitar, but this project makes me cringe. Generally expect to see a variety of performances and local music folks schmoozing -- and you can schmooze too! Maria Tatar & Odds Bodkin, "Stories and Storytelling"
Prof. Ha Jin won the National Book Award in 1999, so his writing must be good. (I've always heard positive reactions.) "A Good Fall" is a collection of stories. Update: Also at Porter Square Books on THUR 12/3. Steve Almond's new book is comprised of 30 short stories and 30 essays about writing. What makes this quirky book quirkier is that the book is published via the Harvard Book Store's Espresso Book Machine -- one book at a time. There's a relatively new bingo night in town, and you should have a good chance of winning something since it's past bedtime for most grannies. Bingo-maniacs Kristen Caruke and Classy Miss Cassie are leading the fun at The Model on the first Wednesday of the month. It doesn't cost anything to play, and the beer is cheap. There should be at least 6 games for some boozy prizes. 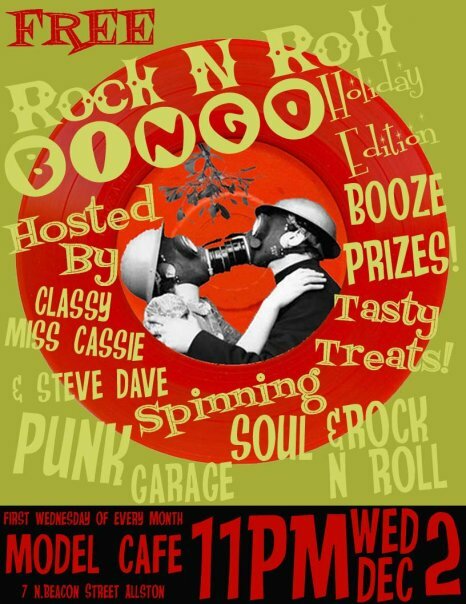 Music will start around 10:30pm; the tunes will be cool mix of garage, punk, soul, and rock with some holiday music mixed in. The bingo begins around 11pm.